Snippity snip. Stitchity stitch. Buttons for eyes. Surprise!Grandpa's old plaid shirt is now my new Plaidypus! Tag along with a lively young girl and her constant companion as they find adventures wherever they go--the park, the lake, or the supermarket candy aisle! And don't forget to keep an eye on Plaidypus, as there's always a chance he'll find himself astray--stuck in the sand, high on a shelf...But no need to worry: Plaidypus lost, Plaidypus found. This story goes around and around!! 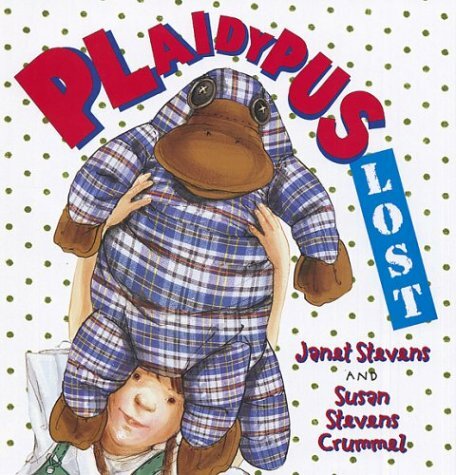 Janet Stevens and her sister; Susan Stevens Crummel, bring to life a heart-warming tale of a girl with a boundless imagination and a very special friend. SUSAN STEVENS CRUMMEL has collaborated with Janet Stevens, her sister, on several picture books, including the Texas Bluebonnet winner Cook-a-Doodle-Doo! and the Texas Bluebonnet nominee And The Dish Ran Away with the Spoon. A former high school teacher, she now spends her time writing and doing author visits at schools. She lives in Fort Worth, Texas. Janet Stevens is the author and illustrator of many beloved picture books, including Tops & Bottoms, a Caldecott Honor Book. With her sister and co-author, Susan Stevens Crummel, she created the acclaimed best-sellers The Great Fuzz Frenzy, Help Me, Mr. Mutt!, The Little Red Pen and more. She is also the illustrator of the Epossumondas books, written by renowned storyteller Coleen Salley. Janet Stevens lives in Colorado. For more information, visit www.janetstevens.com.